If you want to buy a new BMW Z4, you’ll end up spending around $55,000. But if you want to buy a super-heavy artistic non-working replica that you can’t drive or even push around, it’ll cost you $125,000. 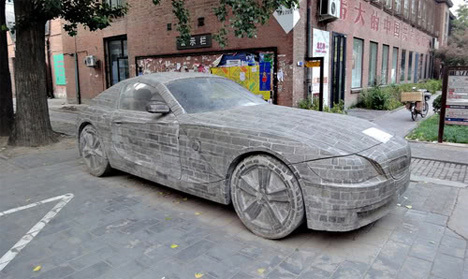 The car’s creator, Chinese artist Dai Geng, hopes that one of his country’s rich businessmen will see his brick recreation of the sports car as a must-have accessory for his garden. 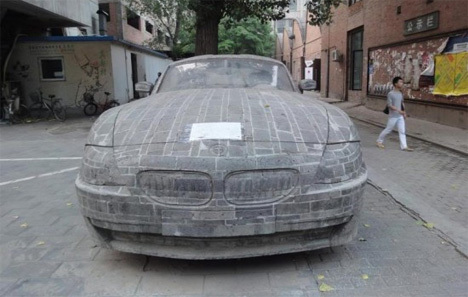 The brick BMW is an incredibly impressive piece of craftsmanship. 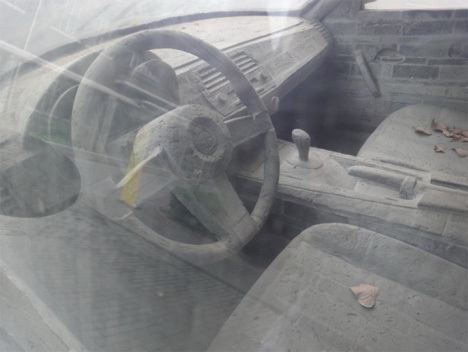 Other than the glass windows, everything on the car is made from bricks. Dai Geng cemented every brick together, a stage of construction that took him more than a year, and then carved the solid block into the realistic speed machine. Even the hinges on the doors – which let the brick doors actually open and close – are made of brick. The interior is meticulously recreated to look just like the real-life BMW, even including the heater vents and door handles. Originally unveiled in January 2010, the car was on display for a year and is now being offered up for sale to whoever is willing to part with 125 large for the most expensive lawn ornament ever. See more in Art Vehicles or under Transportation. February, 2011.